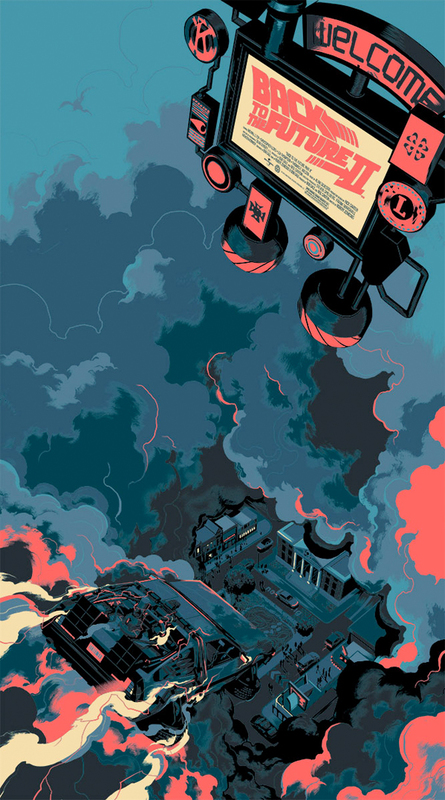 The celebration of Back to the Future Part II continues as 2015, the year which Marty and Doc travel to the future, continues, and this time it's collectible arthouse Mondo checking in with an awesome new print from Matt Taylor. 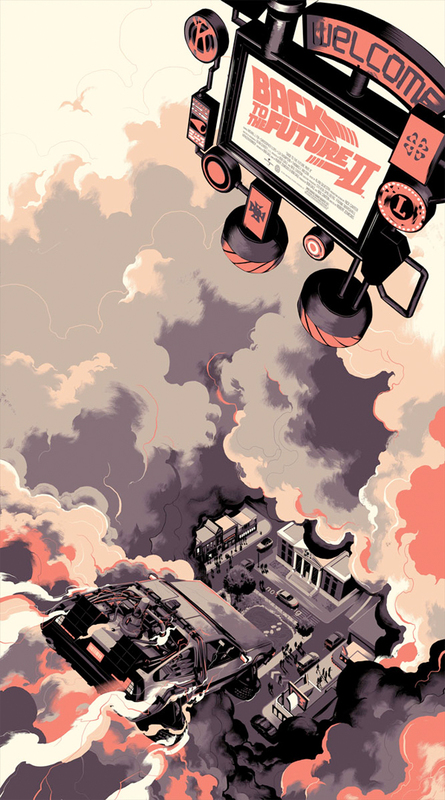 This print features the DeLorean time machine as it descends from the sky to arrive in the Hill Valley of the future, where flying cars are the norm. Taylor has taken the "Welcome to Hill Valley" sign from the film and replaced it with the title of the movie itself. And through the clouds, you can see the famous town square where the clock tower still stands, and plenty of Back to the Future action takes place. The prints just went on sale today, and you might still be able to get your hands on them if you act quickly. Both prints are 20×36, and the regular has an edition of 325 and costs $50 while the variant has an edition of 175 and will cost you $75. We're hoping there's more Back to the Future goodies coming throughout the year. If anything else pops up worth checking out in the future, we'll be sure to post it, so stay tuned. Freakin' sold out already! Argh! I've never understood the point of these super super low amount of prints they do. Why limit yourself when there is demand?